AirDrop is the excellent wireless file transfer feature available to Mac, iPhone, and iPad, and with it you can easily and quickly transfer pictures, movies, documents, and whatever else between any iOS or Mac OS device. Being on the receiving end of AirDrop, have you ever wondered where AirDrop files go on a Mac or on an iPhone or iPad? Wonder no more, we’ll show you exactly where AirDrop files are saved to and how you can access their location in iOS and Mac OS. Obviously you’ll need to have received an AirDrop file on a Mac or iPhone or iPad to be able to track down where AirDropped files go and are located, so if you want to try this yourself you’ll probably want to quickly AirDrop a file to yourself from another device. Otherwise, read on so you know where to look in the future for data transferred by AirDrop to Mac OS or iOS. Using AirDrop to move files between Macs is fast and easy done entirely through Finder, but have you ever wondered where those AirDrop files are saved? It turns out that AirDrop files on a Mac go into the user Downloads folder by default. Thus, if someone sends you a file via AirDrop to your Mac, you will want to look in your Downloads folder. There are multiple ways to access the Downloads folder on a Mac, perhaps the quickest way for most users is to use the Dock or the Finder. This applies to all file types transferred by AirDrop to a Mac, whatever they are, whether movies, photos, word documents, texts, presentations, PDF files, images, you name it, all files from AirDrop go into the ~/Downloads folder. Using AirDrop to move files and pictures to iPhone, iPad, and iPod touch is also super easy and accessible from Control Center as well as the Photos app and Sharing functions. Because iOS does not have an official user accessible file system however the AirDropped files will go to different locations depending on the file type being transferred. This might sound a little confusing since there is not a central location for AirDrop files in iOS, but the way it is presented to the user is quite simple. Photos and videos transferred to an iPhone or iPad via AirDrop will appear in the Photos app and your camera roll. 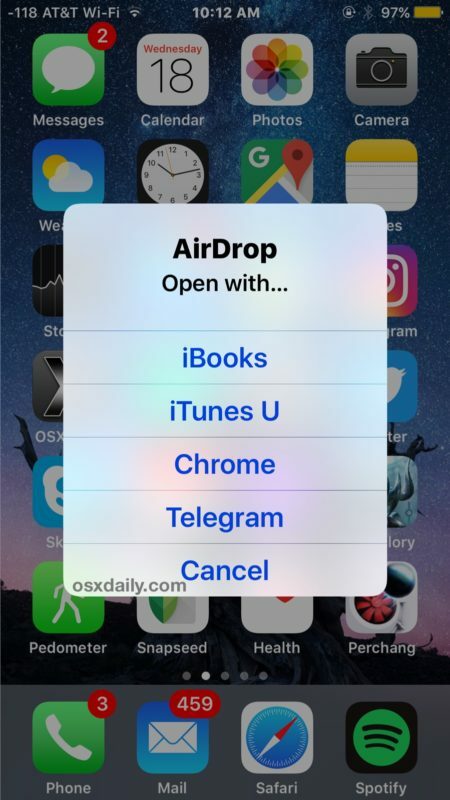 Other files, like PDF, doc file, text, etc, will bring up a little menu with different options available on the iPhone or iPad to open and store the file that has been AirDropped. Once you get an AirDrop file to an iOS device, you just need to choose an app to open it in, and the file will then be copied and available to that app. If the file is a PDF or something similar, iBooks is probably the best location for it, whereas other files may be better stored in DropBox or another similar app that mimics file system access. Perhaps in the future AirDrop in iOS will allow storing files received in iCloud Drive? Because of the way iOS handles AirDrop files, some users may think it’s not working properly when it actually is (by the way, if you actually do have a problem with the feature we have two excellent guides on troubleshooting AirDrop not working issues in iOS here and here if AirDrop isn’t showing up at all in iOS). Just remember, with photos, videos, movies, and images, they go into the Photos app by default, whereas other file types will reveal the pop-up menu to show where the user chooses to send the file to. I always wondered in Mac why Airdrop files didn’t simply go to the Airdrop folder. Very confusing UI decision. I have a Macbook Pro, Summer 2010, now running OS X 10.12. I cannot find AirDrop on the Finder sidebar. It shows up in System Preferences (in Extensions) but although it shows the box as clicked it is greyed out. Can anyone suggest how to get access to that. There doesn’t seem to be an “unlock” button anywhere for that section. Open Finder, then go to Finder/Preferences and tick AirDrop under “Show these items in the sidebar”. If it isn’t there then your Mac doesn’t support AirDrop. Thx Kevin. I suspect, as simple as it is, this is the ultimate answer. It’s not that bad though. I don’t need AirDrop; I just wanted to have it if I was supposed to be part of my package. Try dragging the folder from apps to your sidebar. It looks like your Mac is too old to support AirDrop. It needs to be 2012 or later. Camera roll does not show up on my photos sidebar. I have a 27 inch Desktop, Latest model. Is this just the settings adjustment? The most annoying thing of airdropping pictures between your ios device and your Mac is that, if your Mac is currently using the same iCloud account as your iOs device, MacOs don’t prompt you about where to save those pictures… So automatically they are saved in Downloads folder. If you airdrop to a Mac that isn’t using the same icloud account as your device, you are prompted about saving them in Download folder or, infinitely better, if you want to directly save them to Foto!!! Unbelievable they never fixed this issue! Maybe someone here knows a workaround? I have a MacBook Pro, and an iPod. I have previously successfully used AirDrop to transfer files from a Mac Mini to this MacBook Pro, and when I did that before, the transferred files appeared, as mentioned in this article, in my Downloads folder on the MacBook Pro. However, today, I am unable to find files that I transferred from my iPod to this same MacBook Pro, and they do not appear in the Downloads folder. What should I do to try to find them? I sent some pdf files to my iphone yet i did not opened only canceld , so my question did those files were deleted or moved to somewhere ? A Million dollar question! Also, how do you airdrop a file (.pdf) further from the airdropped iPhone when opened for example with Chrome?? Same thing happens to me. Filetypes like mp4 to Photos but others (flv, avi, wmv) just vanish. I have VLC but they’re not accessible there. I’ve checked iMovie, Filmic Pro and every other app I can think of. If you have deleted an video or picture from an airdrop that was sent to you, and also deleted it from ‘recently deleted’ file as well… IS there any word yet on where and/or what to do to be able to recover those videos and photos in any way back on to your device? I AirDropped 5 .avi files from my Macbook Pro to my iPhone 7Plus. They are nowhere to be found – they are not in my Photo folder (nowhere), not in Videos. I’m confused (and slightly annoyed as they were large files which are now taking up a lot of space on my iPhone even if I can’t find them!). Any other suggestions? in case i received an access file via airdrop, before having the access app installed. can i retrieve the file on my iphone? and is it possible to access it on my mac? AirDrop is conceptually simple. It’s super convenient once you figure it out, and when it actually works. Given that, it’s hardly an “excellent” feature, since users need articles like this one to make sense of it. Hi guys. I Airdropped some Pages documents from a Mac Mini to my iPhone 6s iOS 11 – and they went to a Medical app that I had? I would’ve thought they’d go into iCloud or the Pages app. Does anyone know how to direct airdropped files to the right location? Can i copy it to the computer? Where does not recognize files go? I have airdropped from my iPhone to my iPad, but nothing is showing up in my photo app. Is it because my iCloud storage is full. Is there any other way of transferring because I don’t want to subscribe to iCloud? AirDrop does not require iCloud subscription, if you airdrop a Photo it shows up in the Photos app of iOS. If you airdrop another file, like a PDF, it may go to a different app. I cannot get airdrop to function let alone work “excellently” as stated in this article. It would have to be one of the most poorly designed and conceived aps apple ever had. The concept is great but the execution is woeful. I have tried to download images from my iPhone to my MacBook Pro, and more than half the time I cannot find them. Sometimes they are in Downloads, but more often I cannot find them no matter how hard I look. This feature is a disaster at present. I airdropped a folder from my iPad to my iPhone. It was about to finish but my iPhone’s screen slept and I didn’t see the pop-up menu and the file is in the others section. How can I delete it?? It’s 7 GB.